NOTE: This is a patently self-serving excerpt as it has been chosen because it pertains directly to the family story told on the various webpages posted at this site. The rest of the story of the Japanese settlers and their subsequent eviction is well worth knowing and Hashizume's book can be ordered as indicated. Pfitzer bell tower that is part of the monastery, is now a landmark structure of Mission. explained to her that names were to be chosen from an existing list of names of pioneers. The list itself was made up entirely of Anglo-Saxon names. were no Japanese names on the approved list of pioneers. 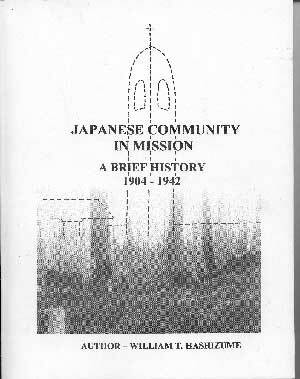 Community Archives, and sought her assistance in compiling a list of Japanese pioneers. list. This request was passed unanimously. Each name on the list is researched by the staff at Mission Community Archives. done to ensure the name meets the criteria established by the Council for street naming. pioneers in recognition of their contribution to its development.